Kyron McMaster capped off four double doubles with a 200m personal best on Saturday evening, highlighting the 2-day Premier Dental National Jr. Championships, held at the A. O. Shirley Recreation Grounds. McMaster chewed up the field in the Under 20 and Open Boys 200m to win in 21.87 seconds, before ending the meet with a season’s best of 48.53 seconds in the 400m. He was followed by Fast Lane Track Club teammate Ronique Todman in 49.49 and Top Notch Track Club’s Tarique “Tweety” Moses in 49.56, marking the first time that three athletes had broken 50 seconds on home soil in the same race. 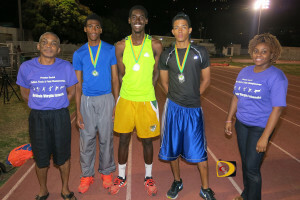 Sprint Tech Track Club’s Keci Moses had a100/400m double in the U18 Boys event, with times of 11.23 and 52.18 respectively. Top Notch’s Nelda Huggins Nelda Huggins—who moved to the U20 Girls division this year—won her fifth straight 100/200m double double, with season’s bests of 11.85 and 24.95 seconds. She has won a Carifta Games medal every year since 2011 and has seven to her credit. In a battle of 14 year olds, Raw Skillz Track Club’s Mariah Christian became her club’s first Jr. National Champion when she held off Sprint Tech’s Acada Charles over the last 150m and fast charging Top Notch’s Z’Niah Hutchinson, to win the U18 Girls 800m in 2:37.77. Charles was 0.06 faster than Hutchinson—2:37.90-2:37.96.Christian won the 1500m in 5:45.66 to Charles’ 5:55.88. Other notable performances of the meet came from Sprint Tech’s Tarika “Tinker Bell” Moses and teammate Beyonce DeFreitas and Arianna Hayde. Moses who will compete in the U20 division this season and established an indoor National Record of 2:12.46 in her 800m debut last month, made her first outdoor appearance in the 400m prelims with a 55.57 seconds time. She did not contest the final. DeFrietas who turned 14 on Tuesday, missed her 400m personal best by 0.03 when she was a 13-year old, taking the final in 56.89 after turning in 57.14 in the prelims. Hayde—using the meet prep for the Heptathlon and the U18 Girls Open Javelin Throw—copped a huge Long Jump personal best and moved to No. 9 on the All Time List, when she cut the sand at 5.41m (17’9”). Kala Penn turned in a season’s best of 5.58m (18’3¾”). Hayde followed up her 39.59m Javelin Throw best from last month with a 38.90m effort. U.S. Virgin Islands’ Avrey Joseph of St. Thomas, was the only U20 Boys Javelin Throw competitor to break the 50m barrier with his 52.09m winner. Elsewhere, Tynelle Gumbs opened her outdoor season at the Central Arizona College’s Throwers Pentathlon on Saturday with a Discus Throw personal best of 42.16m among her five events where she scored 3400 points to place second. Twin sister Trevia was fifth with 3039, but added three meters onto her previous Discus Throw best with a 37.77m effort. Eldred Henry scored 3449 for a win, highlighted by a 41.89m Hammer Throw measurement, the No.2 BVI mark on the All Time List. St. Augustine’s sophomore Khari Herbert, competing at the NCAA Division II Indoor Championships in Birmingham, Alabama, was seventh in the 400m in 48.04 seconds, after running a personal best of 47.92 in the prelims. Cary High School Sr. Lakeisha “Mimi” Warner, competing in the New Balance High Schools Nationals in New York, ran her 400m in 57.24 seconds. At the Trinity Prep Invitational in Winter Park, Fla., Montverde Academy Tahj Malone cleared the bar at 6’2” to win the High Hump, while teammate June Kinkead ran a personal best of 12:02.25 in the 3200 meters.